The Resort at the Mountain, in Welches, Oregon, on Mt Hood, is a beautiful place. Its 27-hole golf course wends its way through fir trees and around lakes; they have a new spa; tons of beautiful condos and rooms; banquet halls; and much, much more. Instead of just a single day of wedding festivities, Travis and Nicole took advantage of the Resort’s facilities and spent several days with their families and friends, playing games, eating well, golfing, and having a great time. The wedding itself was the culmination of this long weekend of fun. And what a wedding it was. With a large wedding party, and a long guest list, it was an event not to be missed. From the ceremony on the Pine Bluff, to our portraits along the river, to the dinner and dance party in the ballroom, it was a full day. 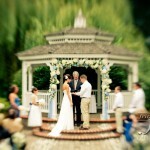 We’re proud to be an award-winning Portland wedding photographer, and would love to tell your love story. Contact us today to talk with us about your big day! And visit our site today to view more Resort at the Mountain wedding photos!